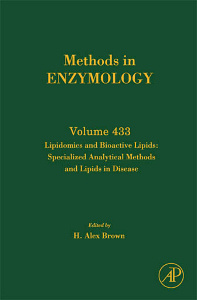 A Detailed HPLC/MS/MS Method; Lipidomics in Diabetes and the Metabolic Syndrome; LC-MS-MS Analysis of Neutral Eicosanoids; Quantification Of F2-Isoprostanes In Biological Fluids And Tissues As A Measure Of Oxidant Stress; Measurement of Products of Docosahexaenoic Acid Peroxidation, Neuroprostanes, and Neurofurans; Enantiomeric separation of hydroxy and hydroperoxy eicosanoids by chiral column chromatography; Targeted Chiral Lipidomics Analysis by Liquid Chromatography Electron Capture Atmospheric Pressure Chemical Ionization Mass Spectrometry (LC-ECAPCI/MS); Shotgun Lipidomics by Tandem Mass Spectrometry under Data-Dependent Acquisition Control; Identification of Intact Lipid Peroxides by Ag+ Coordination Ionspray Mass Spectrometry (CIS-MS); Quantification of Cardiolipin by Liquid Chromatography Electrospray Ionization Mass Spectrometry. Kyle O. Arneson and L. Jackson Roberts, II. Graduate students, researchers in academics and industry studying biochemistry.